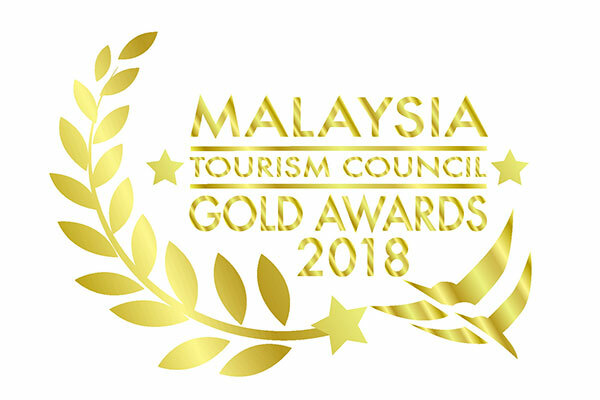 Hidden away on the east coast of Pulau Tioman, Juara Beach retains the charm of a secluded, unspoilt 2km long golden sand beach, voted by CNN as the No.21 most beautiful beach in the world, amidst the peaceful village of Kampung Juara. 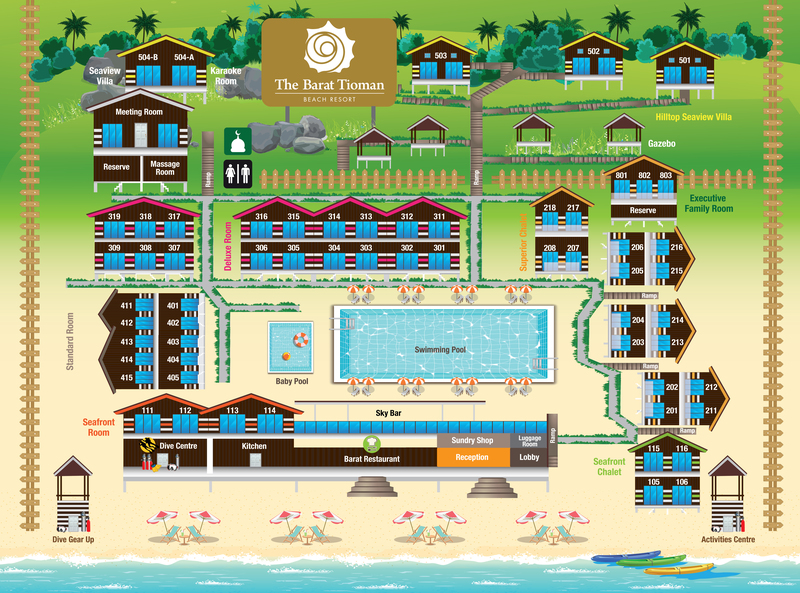 Here, discover the warm and welcoming ambience of The Barat Tioman Beach Resort. 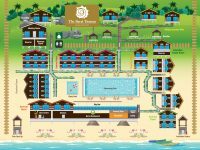 Located on 5 acres of sprawling beachfront property, The Barat Tioman invites you to stay in air-conditioned comfort in one of our 56 spacious rooms with modern amenities. After an exciting day of discovering nature-inspired adventures, cool down by the swimming pool with a refreshing drink from our rooftop Skybar, or enjoy delicious bites against an ocean view at Barat Restaurant with your family and friends before heading back to your room for a hot shower and relaxing time as you watch TV. Kampung Juara is the only village on the east coast of Pulau Tioman that is accessible by road. This relatively undiscovered part of the island features the quiet and tranquil Juara Beach, which is the ideal venue for sea and water sports activities. Here, you can swim, kayak, surf, or stand up paddle board on the clear blue waters. 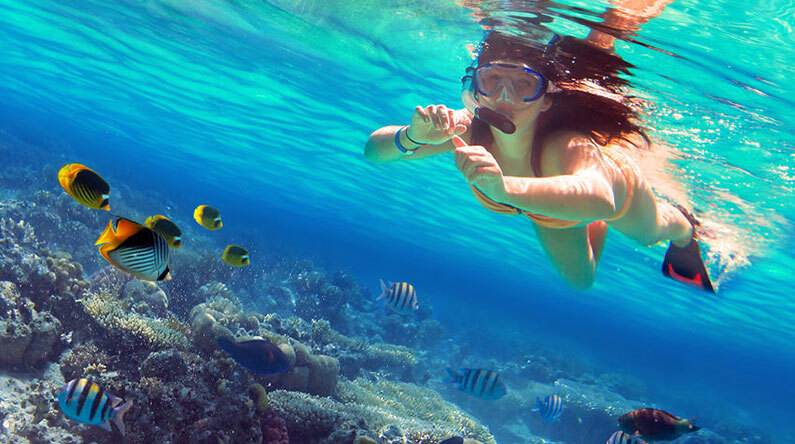 Under the sea, the fascinating marine ecosystem beckons you to snorkel or scuba dive to explore the wonders of the ocean. A trip to the waterfalls will leave you feeling refreshed while a jungle trek through the tropical rainforest will allow you to discover the local wildlife. You can also learn more about turtle conservation at the neighbouring turtle sanctuary or play a game of beach football or beach volleyball as you enjoy the warmth of the soft, smooth sand under your feet. Visit The Barat Tioman’s Recreation Centre to explore all these adventures and more with the help of our experienced recreation guides. 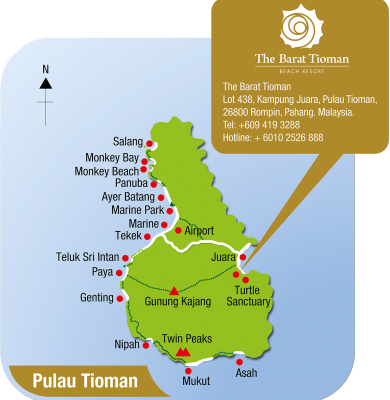 Pulau Tioman is teeming with marine life and coral reefs, and is a haven for nature lovers to enjoy and explore. The island’s sandy golden beaches, warm seas, lush rainforest, and endless sunshine make it one of Southeast Asia’s most attractive travel destinations. According to legend Pulau Tioman which is located on the east coast of Pahang in Malaysia, was the rest stop of a beautiful dragon princess who whilst flying to visit her prince in Singapore fell in love with the surrounding waters and decided to settle there permanently by transforming her body into an island. 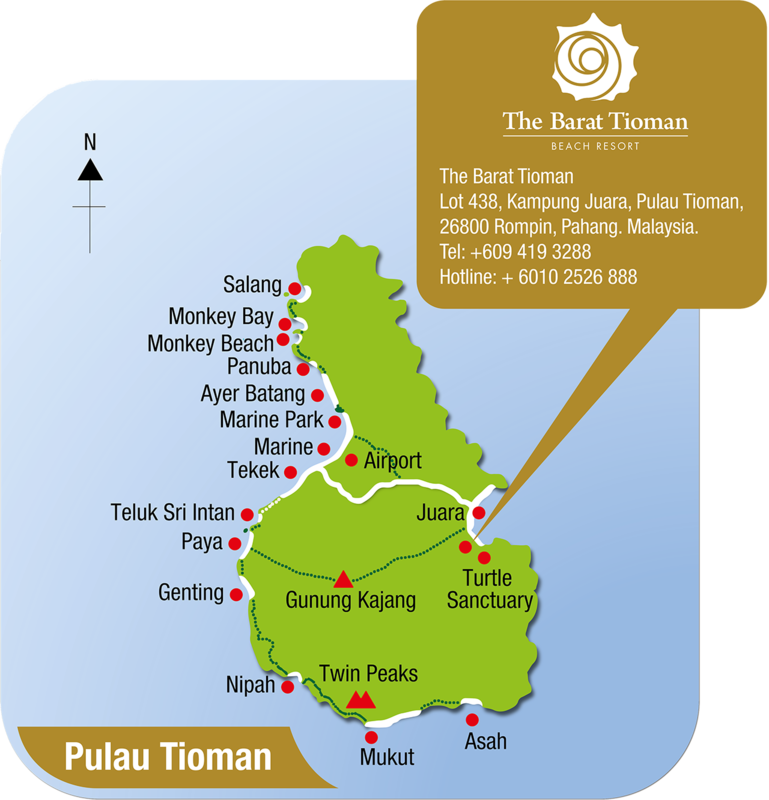 The twin peaks, Pulau Tioman’s famous landmarks, are believed to resemble the ears of the legendary princess. Hidden within Pulau Tioman’s tropical rainforests you can spot macaques, black giant squirrels, and various bird species which feed on local fruits. During the day, giant Asian water monitor lizards surface in search of food while colourful snakes and agamid lizards that resemble small dinosaurs play hide and seek among large tree trunks. At night, watch out as slow lorises, brush-tailed porcupines, civets, and mouse deers come to life as you listen to the sound of katydids and cicadas fill the air. Pulau Tioman’s duty-free status is another attraction as tourists can buy chocolates, alcoholic beverages, and cigarettes at duty free prices.